"Watchmen: The Complete Motion Comic" (2008) is an animated short film series based on the comic book of the same name. It has 12 parts, each one corresponding to a chapter in the original comic. It takes place on an alternate Earth in which Richard Nixon has remained President through the 1980's. The plot concerns a group of extremely dysfunctional superheroes who have mostly been forced into retirement. When one of their number is murdered, some come out of retirement to track down the killer. The heroes try to recover in the aftermath of a catastrophe. Nite Owl and Rorshach confront Ozymandias and try to stop a terrible event. Nite Owl and Rorschach uncover a sinister secret about Ozymandias. Laurie (Silk Spectre) is taken away to Mars by Dr. Manhattan. Nite Owl and Silk Spectre break Rorschach out of jail to pursue evidence of a conspiracy against former masked heroes. Dan Dreiberg returns as The Nite Owl. Rorschach's grim past is revealed. Rorchach uncovers a conspiracy, but is then arrested. Dr. Manhattan recalls the accident that turned him into a super powerful being. Lauire and Dr. Manhattan break up, and the world braces for possible nuclear war. In the wake of The Comedian's murder, his former allies remember his life and his effect on them. A retired costumed crime fighter is murdered, and one of his old sidekicks believes he was on a hit list of superheroes to kill. Watchmen The Complete Motion Comic is currently available to watch and stream on The WB. 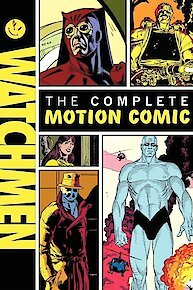 You can also buy, rent Watchmen The Complete Motion Comic on demand at Amazon, Google Play online.